Wrist pain can be a real problem, especially if you use a computer every day. Anyone who has suffered from carpal tunnel understands how crucial good wrist health is. Ergonomic devices aimed at providing comfort and relief from pain are a great solution to these problems. Vertical mice can be a great help to some, and in my case, they were the only kind of ergonomic mouse that helped. Here are the best vertical mice available today to help you keep your wrist in good health! For a fully featured wired vertical mouse, it is hard to fault the J-Tech Digital Scroll Endurance. For a low priced mouse you’ll never need to find batteries for, it’ll do everything you ask of it. Sensitivity is adjustable between 600/1000/1600 DPI, and the mouse is available in two sizes to fit all hand sizes. J-Tech also provides a non-slip detachable palm rest for the mouse. Palm rests for mice are a point of contention, but in this case, after a brief period of adjustment, the comfort outweighs the disadvantages in almost all cases except gaming. The Anker 2.4G Wireless Vertical Optical Mouse is a firm favorite for vertical mice users on the go. The device has a small form factor while retaining an ergonomic shape, and uses AAA batteries rather than a fixed internal battery. While some might see this as a limitation rather than a feature, even heavy users can expect months of usage due to low power usage and impressive automatic power saving when not in use. The simple design features two main buttons with scroll wheel, two thumb buttons, and a top mounted DPI switch easily reachable with the thumb, but out of the way enough to prevent accidental triggering. The mouse has no Bluetooth capabilities. Instead, it uses a tiny USB Type-A dongle which sits around 4mm proud of the case. The Evoluent Wireless Vertical Mouse has a reputation for being among the best ergonomic mice available. Sufferers of chronic wrist pain commonly quote this mouse as being above and beyond the others. The mouse features six buttons, all programmable through the free cross-platform Evoluent Mouse Manager software. Evoluent also opts for the small USB Type-A dongle, though Bluetooth 4.0 connectivity is also available. Power comes from a single AA battery, which comes in the box. This mouse comes at a price, but for relief from wrist pain, we found in our review that it is probably worth it! While ergonomic mice come in a variety of sizes, the Jelly Comb Wireless Mouse For Small Hands is a proven low budget winner for folks with smaller hands. The small form factor of the mouse doesn’t diminish its function, and like many others on this list, it switches between 800/1200/1600 DPI. With the DPI switch, it has five buttons and connects via a USB Type-A dongle to Windows, Mac, and Linux machines. The mouse is rated for up to five million clicks and feels deceptively more sturdy than it’s price tag suggests. Despite its small size, I used a Jelly Comb for several weeks without any problems, though unless you need the smaller size, you are probably going to want to look for something a little larger! Left-handed consumer items can end up costing the user significantly more money to get the same functionality. Not so with the Perixx PERIMICE-718 Left-Handed Wireless Mouse which packs all the same functionality of the other wireless mice on this list into a comfortable ergonomic vertical form. 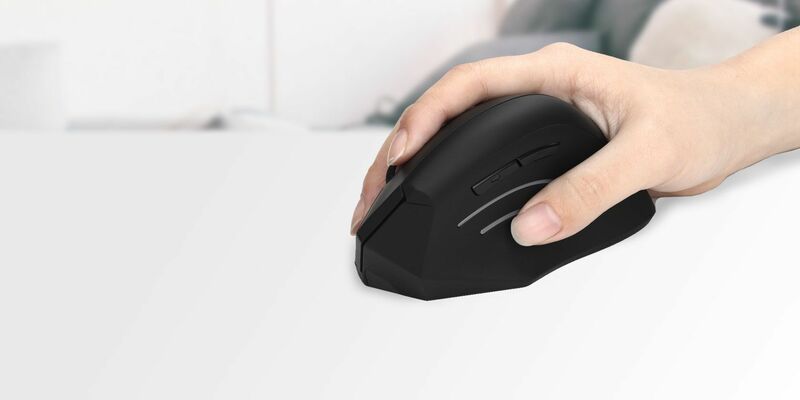 The five button mouse also has a switch for changing DPI to 800/1200/1600 and features the familiar USB Type-A dongle for connectivity. The mouse takes two AAA batteries for power. Perixx provides three different sizes of the mouse at an affordable price, making them an excellent choice for the left-handed mouse users out there. In recent years, USB Type-C has taken over. This is mostly a good thing, but for users of Apple products, it can mean endless dongles and converters to use peripherals. Enter the Jelly Comb Wired Type-C Ergonomic Vertical Mouse, which connects to, and works natively with, USB Type-C devices. This mouse has all the same features as its wireless edition, without the need for batteries. The USB-C connector limits its use on certain machines, but at such a low price this mouse is perfect for ergonomics on the go. Ambidextrous mice are a strange breed. People who love them adore them. People who hate them don’t understand them. Most people, frankly, don’t want or need one. Users of the Posturite Penguin Mouse mostly focus on the ambidextrous nature of the mouse, but even those only planning on using on one side may also see benefits. The angle this mouse gives for users if unlike any other mouse on the market. The mouse communicates using a USB dongle, and is powered by an internal battery rated for up to 30 hours of use on a single charge. Again, this isn’t stacking up well against others on this list, but if you are looking for a unique mouse that gives something no other does, this Penguin is for you. Starting good habits is essential for online freelance work, but regardless of whether you work from home or an office, looking after your health has to come first! A vertical mouse isn’t something you’ll likely be considering unless you are in pain, or are wanting to prevent it. Vertical mice could help, but you should be aware there are other types of ergonomic mice you can choose from.